I made yesterday a rest day, but that doesn’t mean I didn’t spend a bunch of time thinking about running! What came in this bag? That’s right, I’m back in Brooks! You’d think after 8 years of running, I would have settled on a shoe by now, or at least a brand. But, I haven’t. I don’t have any significant issues with my feet or stride that requires a special shoe, so I feel good in a lot of different models, and I like to mix it up. From there, I bought a pair of Brooks Pure Something (Cadence I think?) I liked the cushioning of those, they were still light, flexible and a low heel to toe drop like the Nike free, but they were so soft! I really enjoyed them. Unfortunately, they didn’t seem to hold up quite as long my previous shoes. Next, I moved to Newtons. I was really excited about trying those. I’d read a lot about them and thought they were pretty interesting, so despite the price tag I decided to go for it. I liked them a lot! I’ve tried 3 different models. The first ones, the Gravity, lasted 500 miles, and felt great. I then moved to the Distance. These are lighter and slightly cheaper, and I like them, but they haven’t lasted quite as long as the Gravity. I was surprised recently to start feeling the need for new shoes when these just eeked past 300 miles. 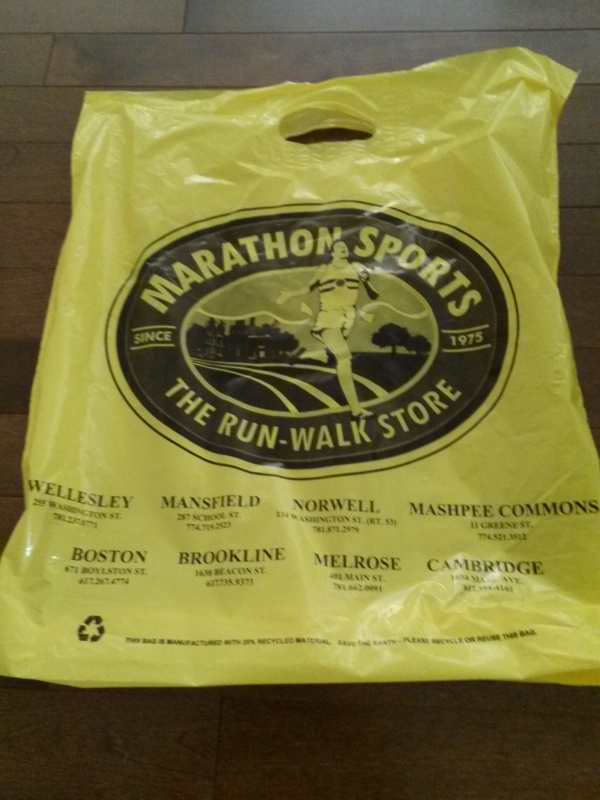 I’ve been running in my “trail” shoes – also Newtons – the last week to make sure that the slight pain in my foot/leg was from old shoes and not something else, and that did the trick. Time for new shoes! *Note about my trail shoes: They are actually called “all-terrain” shoes, I do not run on trails (maybe someday? ), so really the terrain they see is the same as all my shoes – the streets of Beverly. I just like that they’re water resistant and a tad warmer for winter running. I like the Newtons, but I also liked the Brooks, so I went into the running store thinking Newtons, but also having Brooks in the very back of my mind. I brought an old pair of my shoes so someone at the store could take a look at the wear pattern and make any suggestions. I run slightly on the outside of my foot, and I start to feel pain because of that when my shoes wear out, but it’s not so pronounced that I need any kind of correction. That’s good news. Aside from the wear on the side of my shoes, the expert noticed wear on the front near the toes, which led her to suggest a larger size than I normally wear. This is something I would not have thought to do myself, so I was glad to get that advice. 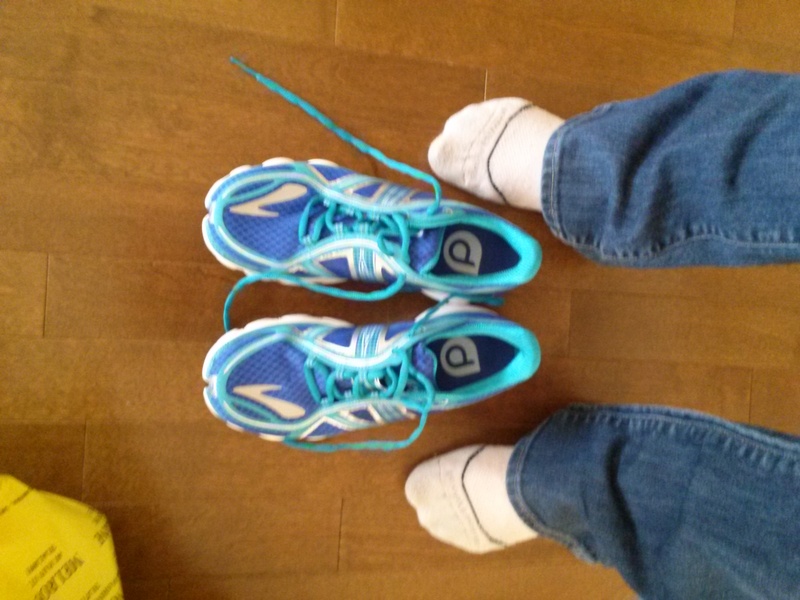 I tried on both Newtons (Energy and Gravity) and Brooks (Pure Flow). I ran around in all three pairs, and narrowed it down to two. 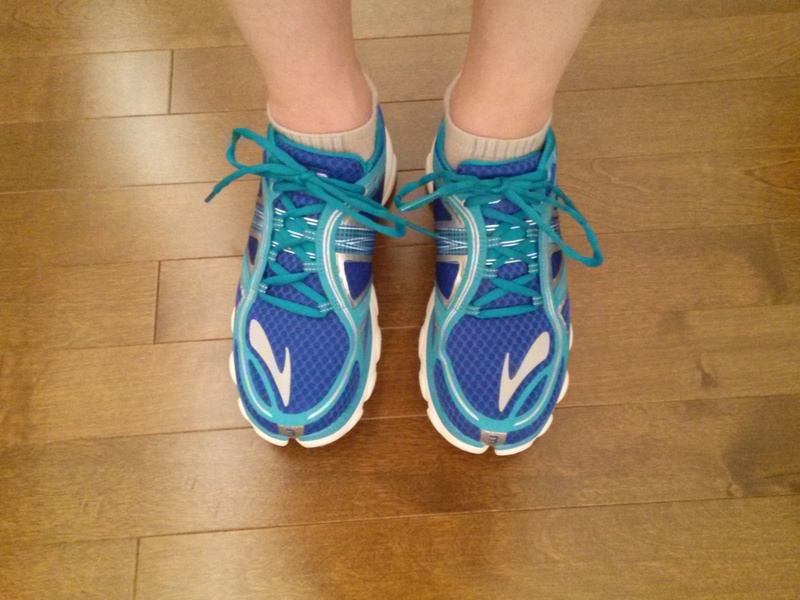 I ended up choosing the Brooks because they were slightly more cushion-y (I love soft shoes! ), and also slightly cheaper. Plus, I like to alternate between a few pairs of shoes, and will still be running in Newtons part time – so I have the best of both worlds. Another picture of my new friends. After all the excitement of the running store, I met up with my friend Christine for lunch. We talked about lots of things, but as with most conversations I’m involved in, running did come up. Christine is running her first 1/2 marathon in the fall and she asked me to make her a training schedule! Or I may have asked if she’d let me make one for her, I love them! I’ll be working on that this week/weekend, woo! She’s also doing a few triathlons this summer, and she keeps hinting that I should do one too. Especially since I started going to spin class (“That’s 2/3 there, right?” she says). I keep declining, but secretly I think I will try a tri someday. Someday when I have a bike, and less fear/disgust about the swimming portion. All in all, it was a pretty fun day, and I can’t wait to give my sneakers their first run today. Isn’t getting new sneakers just the best? Have you ever thought of running a triathlon? Or done it?